Eden is an added value organization. We design all forms of packaging including industrial, retail, club, and displays. We assist your team with the graphics, then manage the production process to ensure all expectations are met. 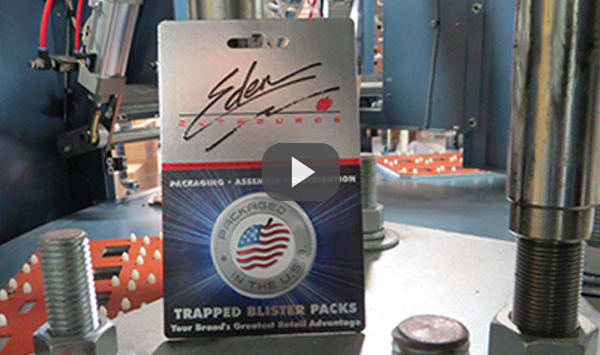 All aspects of your project, from packaging, assembly to distribution, are handled exclusively by Eden's integrated team. Our 32 years of experience helps our customers to streamline their operations, increase speed and efficiency, and eliminate costly charge-backs and redundant handling. From procurement, quality control, and assembly, to the warehousing and distribution of finished goods. Manufacturers benefit through increased production capacity, speed to the marketplace, flexibility and overall reductions in cost. We help customers meet the thriving demands of todays global marketplace.